Previously I did a simple speed test on Maxis 3G. Let see how my new DiGi EDGE is performing. 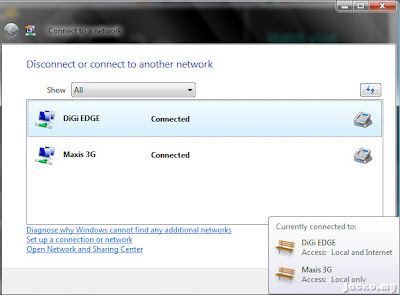 More Maxis 3G result click here and click here for how to setup your phone as modem for DiGi's EDGE/GPRS. Certainly Maxis should be faster than DiGi, it would be a shame to Maxis if its 3G under performs than DiGi's EDGE. However, look the result at my home. DiGi's 225kbps compared to Maxis' 39.5kbps. This could be a proof to what DiGi's committed as what the sales representative told me, you get EDGE whenever you are on DiGi regardless wherever you go. So, you would get 3G nation wide in the future. I could only get GPRS at my home with Maxis and only 3G at selected area in KL. Anyhow, I reserve my words as I have an open issue with DiGi and still waiting their response for another 1 or 2 days before I publish it. Too bad, this isn't possible in Vista. You can see both connected but the second or the last dial up connection will always take precedence over the first connected dial up and demote the first one to local network only. May be there is third party software to workaround it like old time. 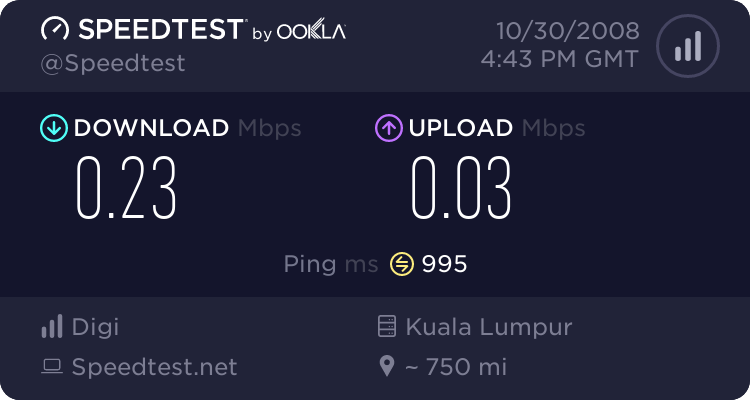 Anyway, this ain't important as I am happy with the speed on either service provider for my browsing and email.